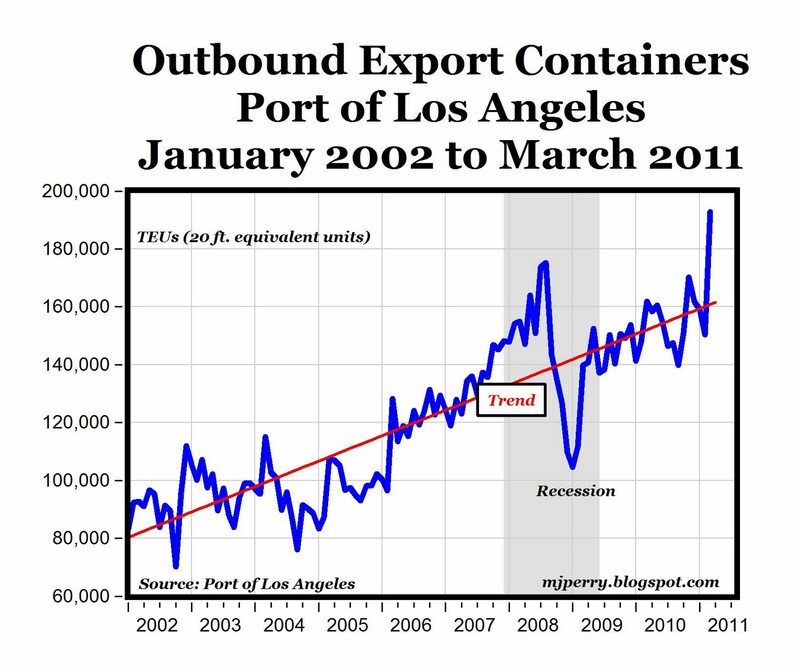 The Port of Los Angeles released data today on March shipping volume, and the number of loaded outbound export containers in March surged to a new, all-time record high of 192,849 TEUs (20-foot-long cargo containers), far surpassing the previous record of 175,262 TEUs set back in August of 2008 (see chart above). 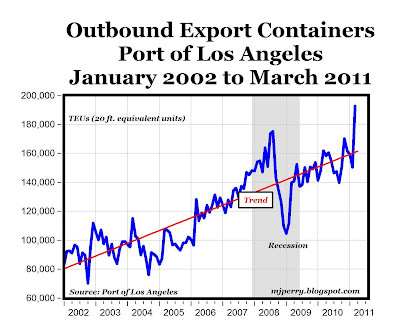 Total shipping volume at the Port of Los Angeles in March was 600,796 TEUs, which was the highest shipping activity for the month of March in four years, since the 629,000 TEUs in March of 2007 before the recession started. The export surge in March could be attributed to: a) the falling value of the U.S. dollar making American products more competitive in world markets, and b) the general economic worldwide recovery leading to increased demand for U.S. products overseas. In either case, the BEA trade report for March should reflect a huge increase in U.S. exports, which would have a positive impact on first quarter GDP. I have never understood people who blubber about a "strong dollar." The current trade-enhancing exchange rate for the dollar is wonderful. I hope the dollar goes lower. The dollar has probably been too high for decades, held up as the global reserve currency. The good news is that overseas sales take time to set up. The current exchange rate is boosting exports, but we should see the real surge in another year, if global growth keeps up. As China becomes more expensive, the last, great low-cost exporting platform on the planet will disappear. I don't think India can replace China--India too clogged with rules, government, human rights etc. (Remember, there is no private property in China--they can build a factory where they want, and pollute to the moon). But business costs are rising in China, inevitably. The USA may make sense as a manufacturing platform again, at least relatively. We are certainly cheaper than Europe and Japan. And we have beautiful cities like Detroit to attract foreign manufacturers. Jeez, I guess subsidizing an industry does pay off for export....agriculture is perhaps our most subsidized and regulated industry, the antithesis of free enterprise...on top of that, the federal government subsidizes rural power systems, water systems, phone systems, roads, airports, rail stops. The whole of rural infrastructure has been subsidized. But, if we can export rural goods, maybe it is not a total loss to our economy--though do not tell Dr. Perry that. "In either case, the BEA trade report for March should reflect a huge increase in U.S. exports, which would have a positive impact on first quarter GDP. " More than half of GDP growth, the last couple of quarters, has been the result of U.S. export growth. Me too. I am counting on it. And you have to love those ag stocks. The ethanol and biofuel subsidies have created a supply shortage that American farmers have been happy to try to reduce by exporting as much product as they can grow. Of course, that brings us to the subsidy question but that is a story for another post. Not to blubber too much but is this the reason for the uptic in the stockmarket? and just how'd I become too big to fail? To paraphrase a reverend... "America's dollars are coming home to roost!" Exporters' gain is everybody else's loss in the US as inflation starts to build. There are a lot of dollars being traded between third parties. If those parties start to dislike the dollar, they will quickly realize that those pieces of paper or perhaps magnetic patterns have no intrinsic value. If the demand for the dollar as a trading tool evaporates, I don't think the demand for the dollar as a spending tool can take up the slack. If the Fed doesn't figure out a way to take its money out of the banks' accounts, we are all gonna be real screwed real soon.